Lao Prime Minister Thongloun Sisoulith has suggested fostering all-around ties between his country and Vietnam, towards deepening the Vietnam-Laos friendship. 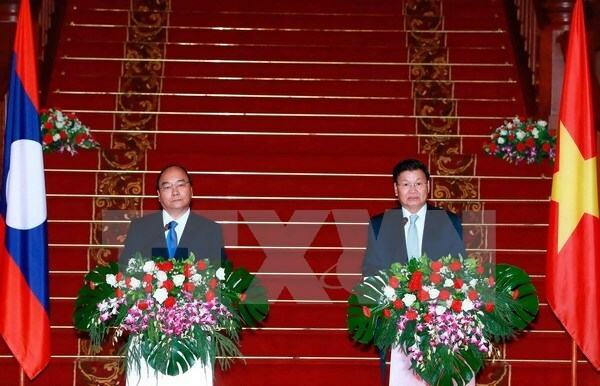 In an interview with Vientiane-based Vietnam News Agency, the Lao government leader stressed the need to step up bilateral relations, which he described as a valuable common asset of the two nations. He called for joint efforts to develop the relationship, especially in educating young generations on the time-honoured relations. He lauded the significant strides in bilateral ties inpolitics, defence-security, socio-economic development and human resources development. The year 2017 is important for Vietnam and Laos as the two nations are celebrating the 55th founding anniversary of diplomatic ties and the 40th anniversary of the signing of the bilateral Treaty of Amity and Cooperation, PM Sisoulith said. Under the leadership of the Communist Party of Vietnam and the Lao People’s Revolutionary Party, the two countries have effectively coordinated in the international arena, he added. The Lao leader also expressed his joy over economic links between the two countries, as well as increasing investment from his country in Vietnam, affirming that this has boosted the position of the two nations in the international arena, promoted economic growth and improved living standards of their people. The two nations should continue working closely to move ties forward, thus expanding friendship, solidarity and cooperation between the two Parties, Governments and people in the future, he stressed./.